Maruti Suzuki is launching the all-new 2018 Ertiga MPV in India today and the car is already available for pre-booking at Maruti Suzuki Arena showrooms for a minimal amount of Rs 11,000. Launched first in 2012, the car is one of the most selling MPV in India largely due to the compact design, advanced technology like SHVS, Automatic Transmission, comfort and features. Officially unveiled at the 2018 Indonesia International Motor Show – the new Ertiga underpins the new Swift, Dzire, Baleno and Ignis. It receives a host of changes, prime amongst which has to be the all-new styling. As part of the new design language, the Ertiga sports a new grille which gets chrome detailing along with projector headlamps which are more angular, giving the car a bold look. The new Ertiga makes itself stand apart and does not come across as a simply stretched out version of the new Swift and the Dzire. The dual tone cabin now has Dzire’s steering and Ignis’ infotainment system. Although the company hasn’t revealed anything officially as of now but the car has been spied completely undisguised several times now, revealing the exterior and interior details. Various speculations about the pricing of the new car are also surfacing online. We are keenly waiting for the official specs and pricing of the new Ertiga, till then you can catch the live updates of the launch here. The new Ertiga gets a redesigned bumper as well, the fog lamp housing is c-shaped and receives a blacked-out treatment. The bonnet is also sculpted in a way that enhances the car’s aggressive design approach. The new Ertiga will be available in various exterior colors - Pearl Metallic Aubum Red, Metallic Magma Grey, Pearl Metallic Oxford Blue, Pearl Arctic White and Metallic Sliky Silver. 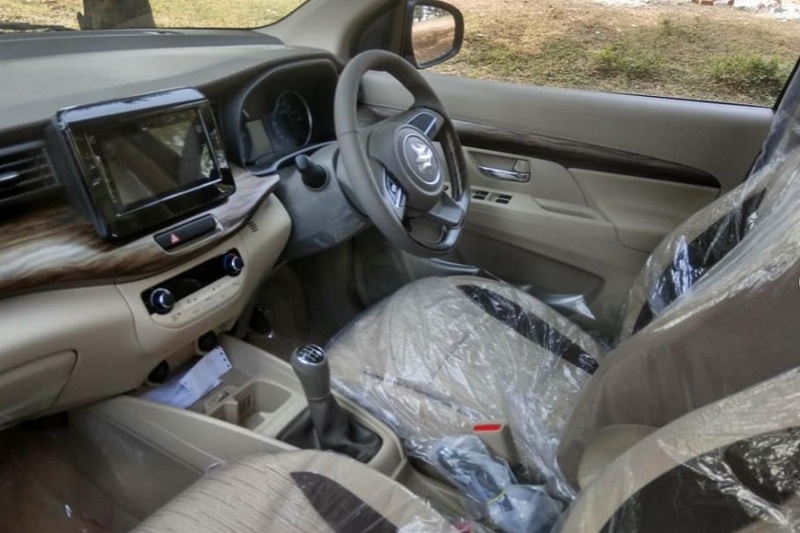 Here is how the new Maruti Suzuki Ertiga interior looks like. The car also gets 17.8cm touchscreen infotainment system that supports Apple CarPlay, Android Auto and Mirror Link. The all-new Ertiga also gets air-cooled cup holders, bottle holders and accessory socket in each row. Inside the cabin, the all-new Ertiga gets dual-tone interiors with mapple wood finish and chrome accents. it also gets leather wrapped flat-bottom steering wheel. The all-new Ertiga gets a progressive smart hybrid technology with Lithium-Ion battery. The energy stored in the lithium-ion battery assists during acceleration. This reduces the stress on the engine while delivering optimal acceleration and performance. The company claims the all-new Ertiga to offer best-in-class fuel efficiency: Diesel - 25.47 km/l, Petrol - 19.34 km/l (MT), 18.69 km/l (AT). The all-new Maruti Suzuki Ertiga is high on safety and rigidity with Suzuki's 5th generation Heartect platform. Kenichi Ayukawa, MD & CEO of Maruti Suzuki India Ltd, on stage to talk about the all-new Ertiga. 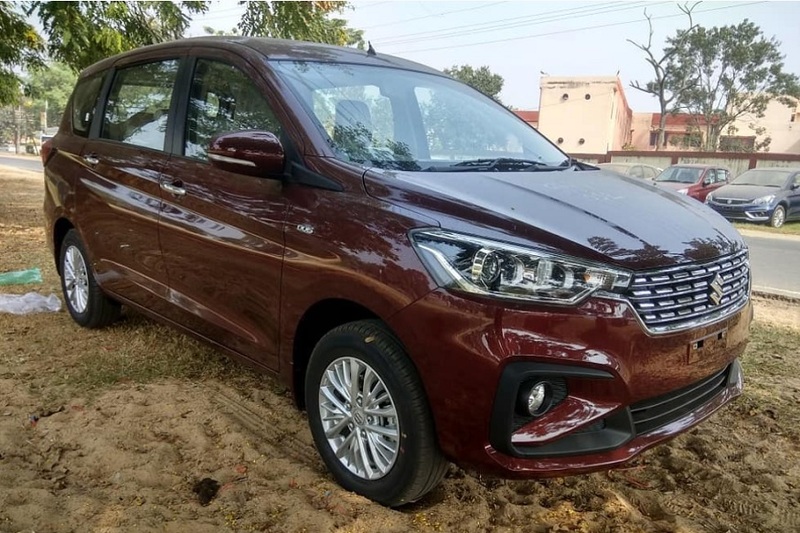 The new 2018 Maruti Suzuki Ertiga is a bit bigger in almost every way as the length has gone up by 99mm, width has increased by about 40mm and the height has increased by 5mm. The new 2018 Maruti Suzuki Ertiga gets a new K15 petrol engine with 13% more power and 6% improved torque output. Maruti Suzuki and suppliers have invested over Rs 900 crores towards the development of the next-gen Ertiga. Designed especially for India, it was launched in April 2012, Ertiga created an all-new life utility segment. It has clocked cumulative sales of almost 4.2 lakh units since launch. The new Maruti Suzuki Ertiga looks bigger and better than before, with the cabin sporting the new-age design language by Maruti Suzuki. Here is how the all-new 2018 Maruti Suzuki Ertiga looks in flesh. The 15-inch alloy wheels and chrome outlining on the license plate on the all-new 2018 Ertiga provides a bold look to the car.